When the newly revamped Westgate Shopping Centre opened in Oxford earlier this year, I was not the only local very keen to see what the cool £440m spent on the renovations had achieved. As well as three floors of shops, covering everything from Primark to Ted Baker, the Westgate's rooftop terrace has a plethora of restaurants and bars to tickle your fancy, overlooking panoramic views of the breathtaking Oxford skyline. 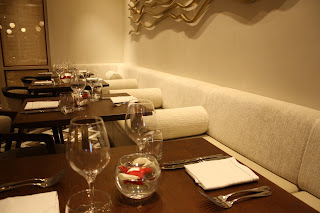 This is exactly where you'll find Cinnamon Kitchen, which bills itself as a chic and contemporary restaurant, serving up innovative Indian cuisine influenced by classic British traditions. 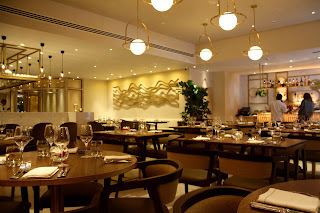 After I sadly missed out on attending their launch event, I was instead invited to dine at the restaurant earlier this week to see exactly what they have to offer! 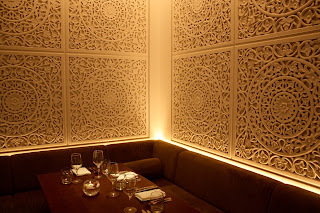 The decor at Cinnamon Kitchen was at once elegant and quirky. 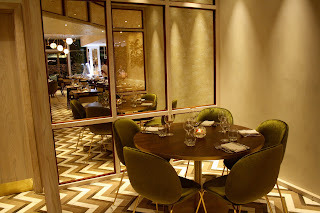 Each area of the restaurant had its own individual charm, from the comfortable soft seating in the corners to the marble counter where you could watch the chefs at work as you eat. 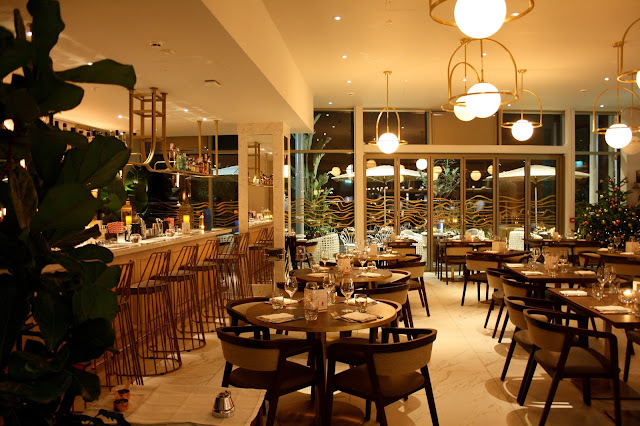 Cinnamon Kitchen may well be the more informal and relaxed branch of well known chef Vivek Singh's established Cinnamon Club, but the atmosphere was still hip and sophisticated. A small but nevertheless very important factor at play in the restaurant that really made a difference in my opinion was the music. It was the perfect fit for the venue; not too loud to be overly noticable and obtrusive but at the same time, it eliminated a lot of the noise from other nearby parties, allowing you and your guests to enjoy your meal and each other's company without distraction. 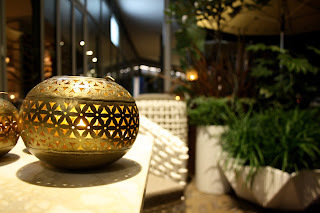 The restaurant also boasts an outdoor seating area, where you can enjoy some drinks or your whole meal. Whilst the November temperatures kept me inside during my visit, in the summer this space will undoubtedly be one of the best spots in the city. 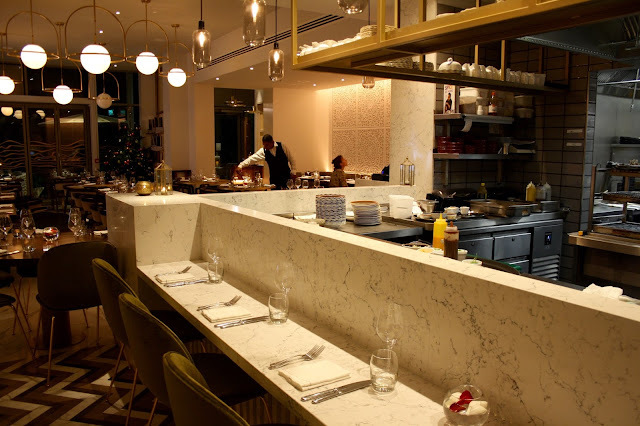 Upon our arrival at the restaurant, we were met by Cinnamon Kitchen's affable serving team. They invited us to make some selections from the cocktail menu, especially developed for Cinnamon Kitchen by world renowed mixologist Tony Conigliaro. 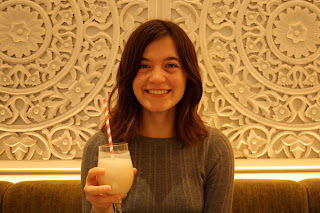 I opted for the Tomato Lassi, comprised of caramelized tomato, yoghurt, fenugreek leaf, whilst my friend Mirjam chose the Tamarind Soda (tamarind with fennel seed). The thick, creamy texture of the yoghurt, combined with the fresh taste of tomato was not a combination I've ever tried before, but it was subtle enough to work very well. The Tamarid Soda was beautifully refreshing. 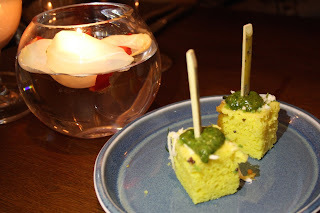 Before our meal began, we were also treated to a "pre-starter" of chickpea cake with coriander and mint chutney, served on skewers. These were as light as air, fluffy yet deliciously flavourful with the chutney on top. Moving on to the real starter, it was very difficult for Mirjam and I to select dishes from the menu on account of the wide variety of choice on offer, even for both of us as vegetarians. It was fantastic to see this many creative meat-free dishes, as so many restaurants sadly lack imagination when catering for vegetarians. 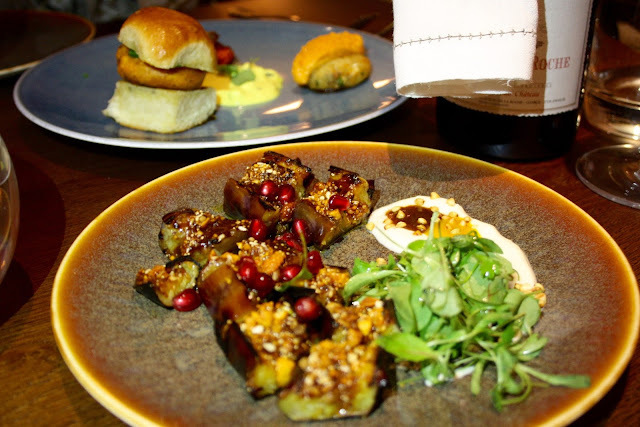 Eventually, we settled on the Bombay Street Food and the Aubergine with Sesame from the grill. The Bombay Street Food consisted of vada pao, tapioca cake, and chilli paneer. Vada Pao is a popular roadside snack native to Maharashtra, a spicy deep fried potato served in a small bun. This had just the right about of bite and flavourful spice. The chilli paneer was another highlight, it was deliciously moist and as fiery as the name suggests! The Aubergine, accompanied by sesame, tamarind, and peanut crumble deconstructs the most popular vegetarian curry in India. Vivek Singh himself told us that he has had customers with tears in their eyes as they experience the flavours of this well-loved dish. There is no doubt that it retains the authenticity of its roots despite being presented in an innovative form. Now for the mouthwatering main course! Again, after much deliberation, I selected the Bitter Melon filled with spiced soya ragout, served with Hyderabadi korma sauce. There were a lot of different flavours in this dish, including tumeric and cardamon in the fragrant korma, but everything worked together beautifully. Cinnamon Kitchen are obviously not afraid of presenting their dishes in a contemporary way, and my dish was a feast for the eyes as well as the palate. 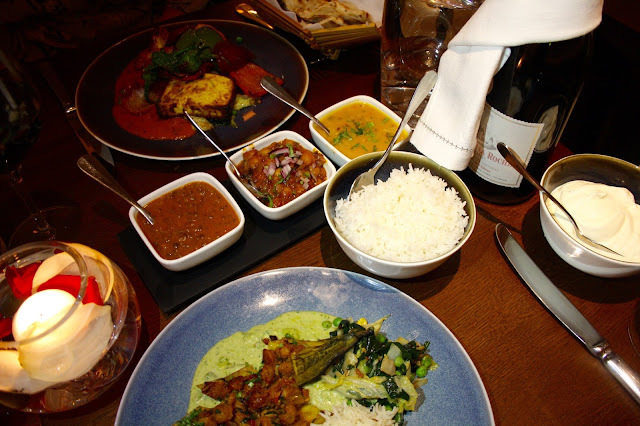 Mirjam chose the Tandoori Trio of paneer tikka, achari cauliflower, and padron pepper. This was a substantial portion, but the vegetables were cooked perfectly and the paneer was delectable. We were also served a selection of side dishes from the dinner menu. The quality of the naan really stood out to me, it was simply delicious. Our meal was washed down with a bottle of Gamay Rouge, Chateau de la Roche from the wine list, selected for us by the ever-helpful serving team once we had made our choices from the menu. The main course nearly defeated us but of course, we left room for dessert. 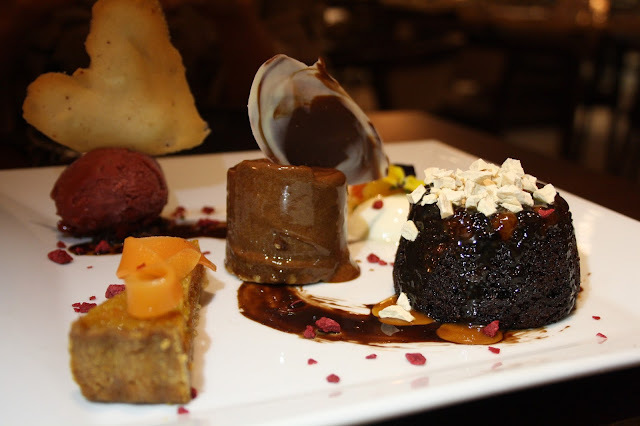 To get a real feel for the variety of dishes on offer, we chose to sample the platter of assorted desserts selected by the Head Chef, which offered us the chance to try pretty much everything on the menu! My personal favourite was the dark chocolate mousse, served atop white chocolate crumble. This was rich and ambrosial without being overpowering or sickly. The Carrot halwa treacle tart was also something that I was curious to try, again because it was not a flavour combination that I had experienced before. The quality of the buttery pastry was extremely high, and the sticky sweetness of the filling was nothing less than divine. The weakest dish on the plate was the Lassi panna cotta, which Mirjam and I did not find the most flavourful, but on the whole, we were thoroughly impressed by this dessert plate. Finally comes the question of whether our meal presented good value for money. Altogether, our bill came to over £130, which I could certainly not get away with paying on a regular basis, but I must say that you do get what you pay for. The service was excellent, all of the staff were attentive and could not do enough for us, and the food really did blow me away. If you are celebrating a special occasion, I would highly recommend a visit to the Oxford Westgate and a meal at Cinnamon Kitchen. During our visit, we even got to meet Vivek Singh himself, the mastermind behind the Cinnamon Club and Cinnamon Kitchen restaurants, who you may recognise from his numerous cookbooks and appearances on Saturday Kitchen. A huge thank-you goes out to Vivek and his team for a truly memorable experience which I would love to repeat. 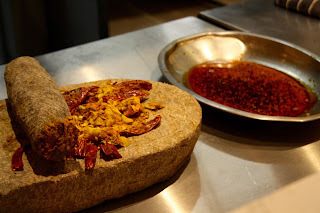 Are you a fan of Indian food? 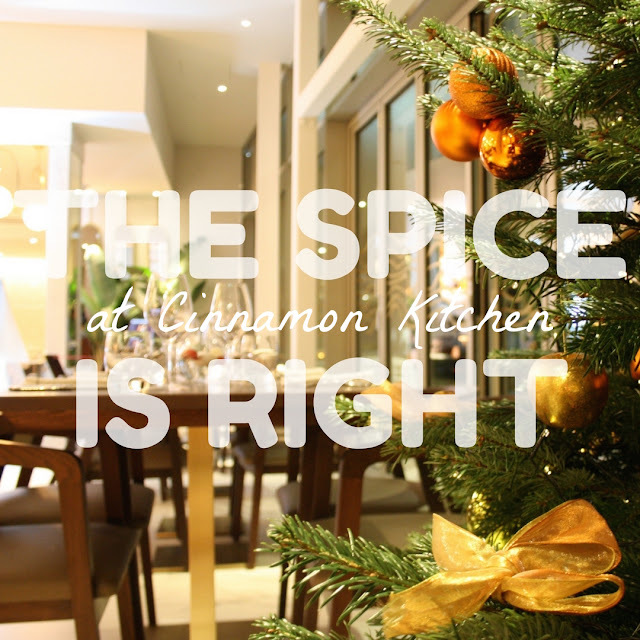 Which dishes would you most like to try from the Cinnamon Kitchen menu? Leave me a comment down below and let me know!